Are you planning some great Summer time vacations? When you leave for that trip out of the country or take the kids to Disney Land for the weekend, don't leave your floor sweltering in the heat. When you leave your house for an extended period of time, DO NOT, I REPEAT, DO NOT turn off the Air Conditioner in your house. Some species of wood can shrink up to a 1/4"! It is okay to turn the thermostat up 4 to 5 degrees, but that is it. You will save yourself thousands of dollars in repair costs. When considering a wood floor, there is a lot of information to wade through to get to the right decision. When it comes to choosing a wood flooring contractor, what separates one company over another. All the websites are clean and have nice pictures, so how do you choose? Is it whoever has the lowest price? Do you pick by who you think gave you the best deal? Like I said above there is a lot of information to wade through. Here at Brian's Masterpiece we want to give our clients as much information as possible, so you know exactly what to expect and get the wood floor you are looking for. We will work with a client as long as it takes and answer as many questions needed, so that the client can make the best decision. Our salesmen are not commission based, so no high pressure and pushy selling. We develop a relationship built on trust, respect, and a desire to fulfill our clients needs and expectations We will make custom samples so that you can know what your floor will look like. We make the scope of work clear. No bottom barrel estimates, then half way through the job come to you with extras and up-selling. We use and provide only the best quality materials. We give you the best from the start. Our best distinctive is that we employ craftsmen that are trained for quality not production. Ask the floor salesman how the installers are paid. Most companies pay by the square foot. So that installer only cares how much flooring he puts in that day, not how well was that flooring put down today. A wood floor is not like painting a wall. If it isn't done correctly, you can't just paint it again or change it. Don't live with a substandard installation or product. Your home is an extension of you, choose Brian's Masterpiece to care about your home as much as you do. So as with all thing actions speak louder than words. Please consider the pictures below of two floors in the same house. One done by Brian's Masterpiece and the other by Home Depot. Our work speaks for itself. Home depot used caulking to fill a half inch gap against a stair cap. Brian's Masterpiece does not accept "good enough". Home Depot leaves telephone cable running across the floor with no place to hide them. Brian's Masterpiece will hide those underneath the floor. Brian's Masterpiece does not need trim, we can cut tight to anything. Considering a wood floor. Consider this information when making your choice. First the biggest difference between unfinished and prefinished wood floors. Prefinished wood floors come just the way they sound. They are colored and given the look the manufacturer has predetermined. Prefinished wood floors come in a very large variety, there is a very high chance that most seekers will be able to find something that works for them. The biggest downfall to prefinished is that you may not be able to match the color you like with the style you like. Also in most cases if you are trying to match something, a couch, cabinet, other wood work, etc. prefinished wood floors can get you close. Unfinished wood flooring can give you the color and style to your exact liking. We can tweak the color and style to accentuate all the subtleties that make your floor unique. Unfinished can also give you custom patterns and inlays that are not possible with prefinished. Unfinished wood floors offer change in the future. If you get tired of the look or color change it without ripping it out. Finally unfinished wood floors can offer one of a kind floors. 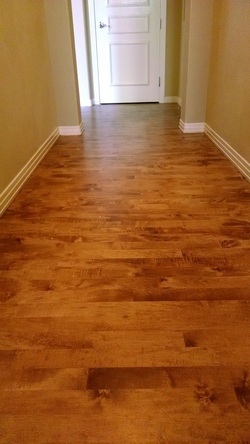 Here at Brian's Masterpiece, we have done wood floors that we will not duplicate for anyone else. There is good application for both types. Ask lots of questions, because the more information you have, you will get a wood floor that is exactly what you want. You will be happier with your decision over the years, knowing that you weighed the differences and determined the best wood floor for your home. Don't Wait Til It's Too Late! It is spring cleaning time! If you have been looking at your wood floor wondering if it can just hold on one more year, this will be a great tip. Just call or email and we will come out for FREE, and inspect your wood floor. No more second guessing. Get the info you need to keep from having to pay much higher maintenance costs down the road. Please don't wait til it's too late, take advantage of a free service so that you can be proud of your wood floors! When redecorating, moving, or finally finishing "that room" in the house, there is always that one piece of furniture that you look at that makes you sigh and rub your fingers through your hair. It's okay you don't have to work around it. If you are just re-positioning the furniture, and it is too heavy to lift, try tilting back and placing some sturdy towels or folded up sheets underneath, and then tilting to the other side to get all the way underneath. Then you can slide you furniture across your wood floor easily. Does your heavy furniture have wheels, but may crease the wood floor if you roll it? Masonite or Tempered Hardboard is cheap at The Home Depot, let that take the damage instead of your beautiful wood floors. If you have to move that piece of furniture up or down a step, using any of the previously mentioned methods will help prevent any damage in case it slips or doesn't go as planned. Finally ALWAYS REMEMBER to put the appropriate furniture pads under your furniture, then sliding it a little here or there won't be a problem. Cleaning your wood floor properly can be a major factor for long lasting beauty. If you bought a floor in the last ten years, the finishes used today are not like the finishes used of the last couple generations. Modern finishes are water based and not oil based, and therefore cannot be maintained in the same way. First consideration for properly cleaning your floor is to get the right cleaner. Avoid at all cost any cleaner that says leaves shiny or anything along those lines. Those cleaners say they are safe for wood floors, but they leave a residue on the surface and over time will start to look streaky and uneven, or can even start to react with the finish and make it cloudy. Here at Brian's Masterpiece we only recommend Bona cleaning products. We have used them for over twenty years and have never had a complaint. Second consideration is saturation. Wood floors cannot be mopped like tile. Misting the floor with a spray bottle or a slightly damp rag is plenty. Whatever kind of cloth you use to clean your wood floor needs to be clean. So always have a few extra terry cloth pads handy. Once they start to get dirty, you are just pushing the dirt around and your floor is not getting as clean as you would like. If you have a wood floor that gets frequent high traffic and use, call to have your floor professionally cleaned, which can save you thousands in refinishing costs. Finally, those with specialty finishes consult the cleaning and maintenance spec for your specialized finished. Poor maintenance and cleaning will result in much higher cost down the road. Protect the most abused areas. Want to keep your most abused areas of your wood floors protected. If you are a busy family that constantly uses the kitchen table, making sure the proper floor pads are under every chair and table leg. If you are a busy family, check them once a year and replace as needed. Have a formal dining room that only gets used for holidays; just check them once a year. Furniture pads come in many sizes to fit all your furniture. They can be purchased at Home Depot, Lowe’s, and usually from your local wood floor company. Just keeping good pads under your chairs and table legs will prevent denting, creasing, scratching, and premature wearing of finish.